I did find some time this weekend for a little bit of crafting (poor Jon has been chained to his computer unfortunately...). 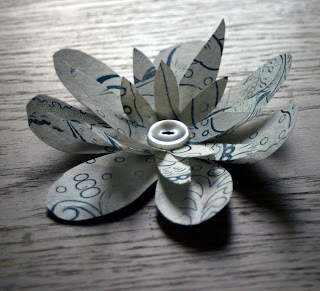 Here is a prototype for Christine's flower collaboration that I blogged about a few weeks ago. It's just three layers of some block printed paper that I had stashed in the spare room, cut into flower shapes and sewn with a button in the middle. Simple, but effective I hope! I'm going to experiment with different papers, colours, buttons, shapes and sizes - there are a few weeks before the deadline, so I've got plenty of time to play around with them. 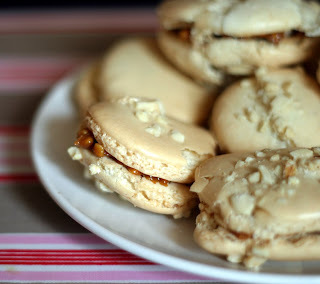 And plenty of time to stuff myself silly with salty-peanut-caramel macaroons from our new cookbook, Ottolenghi, which is brilliant - we've tried a different recipe almost every day this week, and they've all been delicious. Our first post for a couple of weeks - we have been busy dog sitting in the Fens and having various adventures, as well as trying to fit in some work as well! We had lots of fun looking after three elderly dachshunds -not that anyone would know they were old, from the amount of mischief they get up to! 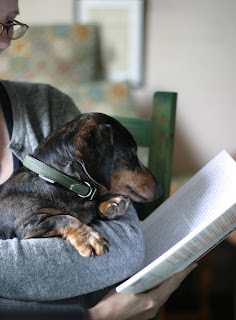 This is Hal, engrossed in a book (he sometimes likes watching tv too). 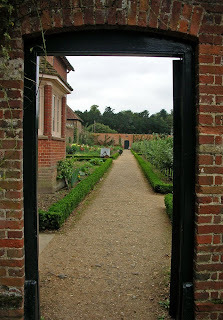 We ate our fill of produce from the kitchen garden, which is much larger and more plentiful than ours is! 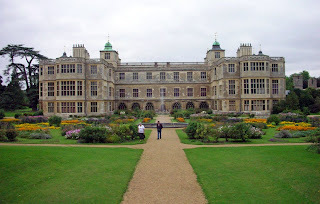 Today we explored the kitchen gardens at Audley End, which are even bigger again! We liked the glasshouses and the mushroom house best. It was another grey and dull day, until we got in the car to go back home and now its really sunny! Hurrah! Still, summer is definitely over, and everywhere smells autumnal. Anyway, no rest for the wicked - we are both working hard to meet some deadlines before we go away on our Landmark Trust holiday, so printmaking has had to go on the back burner - hopefully we might find time at the weekend! I've started clearing the first of the three lino blocks I mentioned in our last post. I've always wanted a set of ceramic flying ducks, but now I'm creating a set of three printed ones instead! This is the largest one - the other two smaller ones need to be cleared as well before I print the first layer. There's a long way to go yet! I've signed up for an interesting project all about handmade flowers, thought up by Christine from Paper and Cloth. Each artist/crafty person involved makes several flowers which will then be sewn together to make one big piece of art. You can find out more about the project (and join in!) on her blog. I'm going to be making some printed paper flowers over the next few weeks - I just have to work out how they could be sewn onto fabric first. I think I might need to experiment with some prototypes! A few weeks ago I was the lucky winner of a Pika Package, and this morning it arrived from Pikaland! 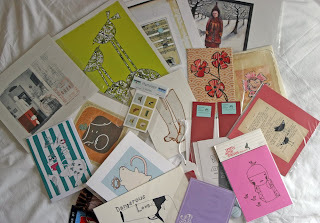 Full of lovely goodies from designers and illustrators from all over the place - all of which are brilliant! I'm so excited - I never win anything! 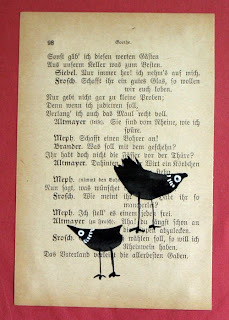 An original drawing on a page of Goethe by Susan Schwake. 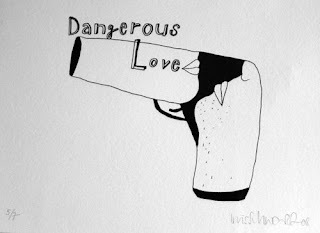 A print by Iris Schwarz. 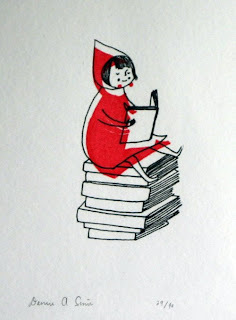 And my absolute favourite - a Little Red Riding Hood set by Denise Ann Simon, including a Gocco print (above), bookplates (below), and bookmarks! I have many other favourites too, naturally, and so does Jon! In the package were some adorable stickers from PhatSheep - I am now coveting the Fair Isle jumper tea towel in their Etsy shop. Apologies for the slightly dodgy photos - it's wet, grey and miserable here today. Where has the summer gone? 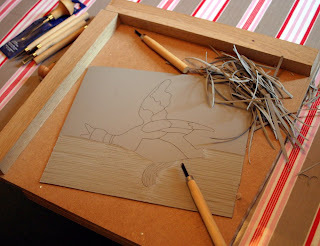 We haven't been idle despite the horrid weather - these three lino blocks are almost ready to start cutting! 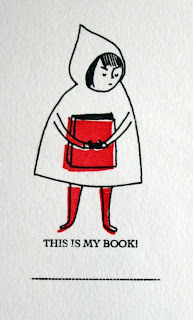 They'll be turned into a set of identical prints in three different sizes, so they'll work together or individually. There is a lot of clearing to do before printing the first layer, which will keep me going through these wet afternoons! 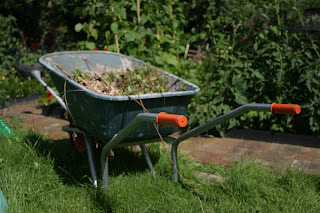 This week everything in our little garden seems to be suddenly ready all at once - loads of peas and beans, courgettes, chard, herbs, tomatoes and the first beetroot. One of my chilli plants has finally flowered as well - hurrah! 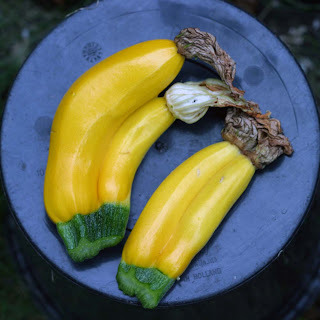 Here are some of our double courgettes... We made a delicious salad with them on Monday night - cut the courgettes lengthways into ribbons using a potato peeler and mix with the zest from a lemon and a lime. Make up a quick dressing with some nice olive oil, a little honey and the lemon and lime juice and mix into the courgette ribbons. Yummy! I'm afraid it didn't last long enough to take a photo of it, but it looked very pretty. The recipe is from Sarah Raven's Garden Cookbook, which we use a lot! 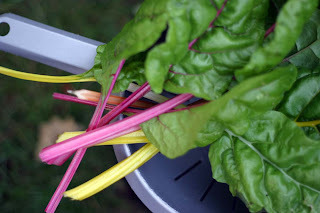 We're also over-run with chard, both pretty and delicious! 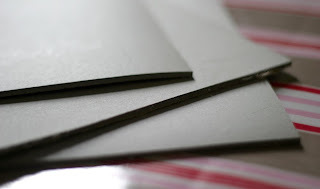 Not much printmaking news I'm afraid - it's been too hot and busy this week to have a chance to do more than think about it, although we are both hoping to start something new over the weekend - so watch this space! 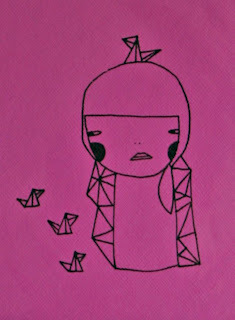 In the meantime, have a look at these lovely little birds by Emily Sutton. They'll be in the new exhibition at St Jude's gallery in Aylsham later this month. We like having the occasional mooch around Aylsham - Humphry Repton is buried in the churchyard, and there is a good second-hand bookshop which usually has some good Penguin finds.